Despite the fact it featured fighting robots, Real Steel was a massive disappointment because it had too much human drama, not enough fighting robots. Not that this matters when it comes to action figures based on the movie. Because they can simply be giant, badass robot action figures. And they can be works of art. This is toy company threeA's take on Ambush (designed by threeA/Metal Gear artist Ashley Wood), not exactly one of the film's most memorable combatants, but certainly one of the most memorable action figures I've ever had the pleasure of laying my hands upon. - 1x Ambush figure, standing 16.5". My God, the detail on this, especially for a large figure, is insane. Even when you pry back the panels, you can see screws, circuitry and damage in places they must have known people were never going to look. It's the kind of attention to detail you want in a big, expensive figure, and it's the kind you get here. Also surprisingly for a large figure, most of whom are little more than cheap statues, this is very articulated. Not only can you move all his main joints, but many can bend and pivot. The best, though, are his neck and arms, where the hydraulics and cables actually operate and shift when you move them. It's a surprisingly light figure, which makes shipping cheaper and posing a dream, but in certain places it can be a little too light to the point of being flimsy, especially around some of the joints. I'd recommend setting him in a pose you like then just leaving him like that. Forever. It's testament to the skill and craftsmanship of threeA that a lesser character from a forgettable movie can be turned into such an amazing figure, but there you have it. 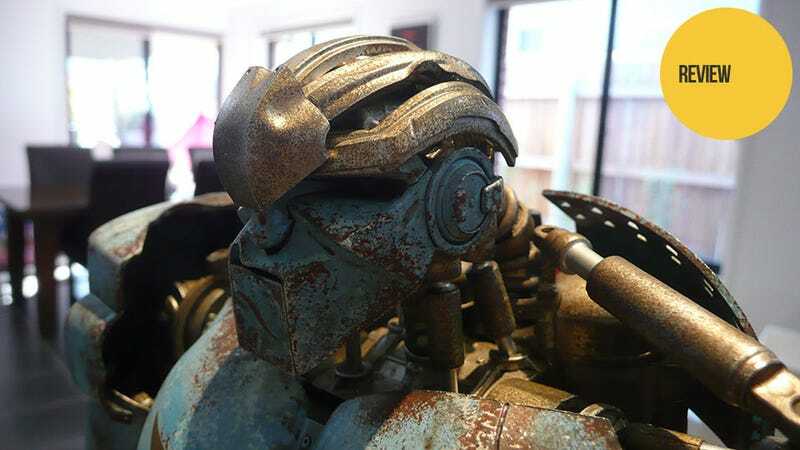 At $320 it won't be for your average punter, but more serious collectors should know that, even by threeA's standards, this is a damn fine figure.